So, yours truly was recently interviewed by the Oak Cliff People newspaper about an art show I have a piece or two in at Boomstick Comics right now. Here is the story, written by Georgia Fisher. So if Rocky Balboa fought a zombie Elvis, who would win? And for that matter, which tough guy would get the girl? “I tried to think of something really iconic that people would recognize,” says Beckley Club Estates artist Marcie Dodd, whose entry in a new show at Boomstick Comics catches Rocky’s Adrian Pennino (Talia Shire) with her head nuzzled against the boxer’s neck. 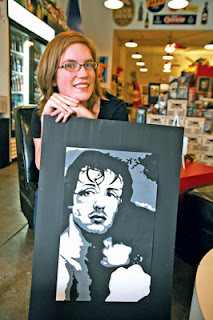 Dodd, 26, used black and white gouache for her ode to the 1976 flick, which will share the red carpet Saturday night with a zombie Elvis and a reel of other icons from cult movies such as Ghostbusters and Night of The Living Dead. The exhibit, dubbed “They Won’t Stay Dead,” is primarily paintings and screen prints of “a lot of horror, sci-fi, and pop culture characters from movies and television,” said Jonathan Kimbrell, art director of the Soda Gallery, which shares space with Boomstick. In addition to the Rocky still, she’ll also hang a monochromatic screen print of the McKenzie Brothers from Strange Brew at the upcoming show.